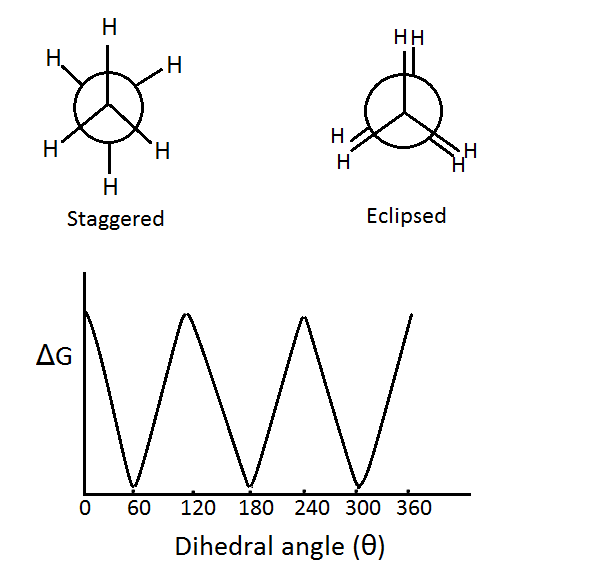 In a previous Chemistry Lesson of the Day, I introduced the simplest case of conformational isomerism – the staggered and eclipsed conformations of ethane. The next most complicated case of conformational isomerism belongs to butane. Here are the Newman’s projections of the 4 possibilities. Modified image courtesy of Avitek from Wikimedia. Clearly, the fully eclipsed conformation has the most steric strain* between the 2 methyl groups, so its internal energy is highest. Clearly, the anti conformation has the lowest steric strain between the 2 methyl groups, so its internal energy is lowest. The gauche conformation has less steric strain than the eclipsed conformation, so its internal energy is the lower of the two conformations. This can be visualized by the following energy diagram. Image courtesy of Mr.Holmium from Wikimedia. *As mentioned in my previous Chemistry Lesson of the Day on the 2 conformational isomers of ethane, there is some controversy about what really causes the internal energy to increase in eclipsed conformations. Some chemists suggest that hyperconjugation is responsible. The simplest case of conformational isomerism belongs to ethane, C2H6. Newman projections of the 2 conformational isomers of ethane. Image courtesy of Mr.Holmium via Wikimedia. The minimum is attained when the dihedral angle is degrees, where is any integer . In other words, the vicinal hydrogens are as far apart from each other as possible. This conformation is called the staggered conformation. The maximum is attained when the dihedral angle is degrees, where is any integer . In other words, the vicinal hydrogens are as close to each other as possible. This conformation is called the eclipsed conformation. 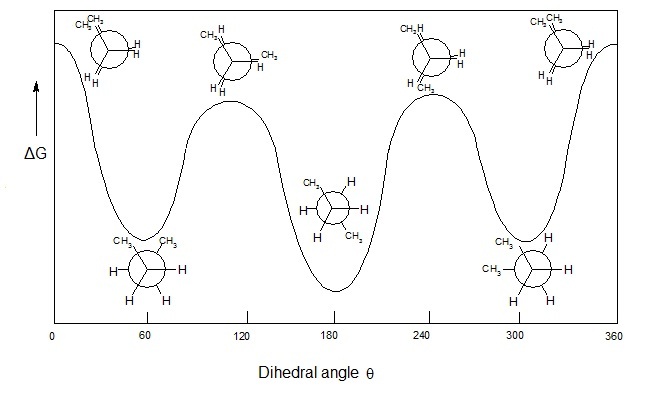 The stability of ethane is dependent on this dihedral angle. If the vicinal hydrogens are far part from each other (in a staggered conformation, for example), then there is less torsional strain* between the 2 carbon-hydrogen bonds, resulting in more stability. If the vicinal hydrogens are close to each other (in an eclipsed conformation, for example), then there is greater torsional strain* between the 2 carbon-hydrogen bonds resulting in less stability. *In my undergraduate education, I learned that the greater stability in the staggered conformation is due to less torsional (steric) strain. However, Vojislava Pophristic & Lionel Goodman (2001) argued that the effect is actually due to the stabilizing effect of hyperconjugation. Song et al. (2005) and Mo and Yao (2007) rebutted this argument in separate publications. Read these articles as searched under “ethane hyperconjugation steric strain” on Google Scholar for more information. Pophristic, V., & Goodman, L. (2001). Hyperconjugation not steric repulsion leads to the staggered structure of ethane. Nature, 411(6837), 565-568. Song, L., Lin, Y., Wu, W., Zhang, Q., & Mo, Y. (2005). Steric strain versus hyperconjugative stabilization in ethane congeners. The Journal of Physical Chemistry A, 109(10), 2310-2316. Mo, Y., & Gao, J. (2007). Theoretical analysis of the rotational barrier of ethane. Accounts of chemical research, 40(2), 113-119.